Thank someone for their service with a custom Retirement Bench. These benches are perfect for business fronts, park gardens, school campuses, and other outdoor areas. To get started on the bench order, give us a call today at (801) 414-1724 or click the option below. Our design team will work with you to create the custom details for the Retirement Bench. This can include: inscriptions, portraits, business logos, and more. Powder coat is applied to the metal and baked at 400 degrees. This process creates a tough outer exterior that is resistant to rust, corrosion, and scratches. We cut our benches from a single sheet of metal that is then bent into shape. This practice requires fewer welds; yielding a stronger bench with less points of weakness. 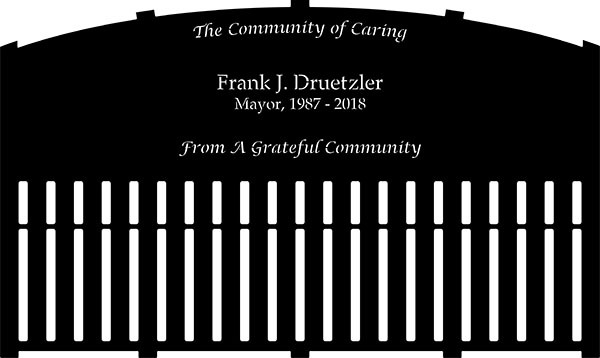 Frank Druetzler served his community as mayor for 32 years. Over 350 friends and colleagues attended a special retirement party in his honor. 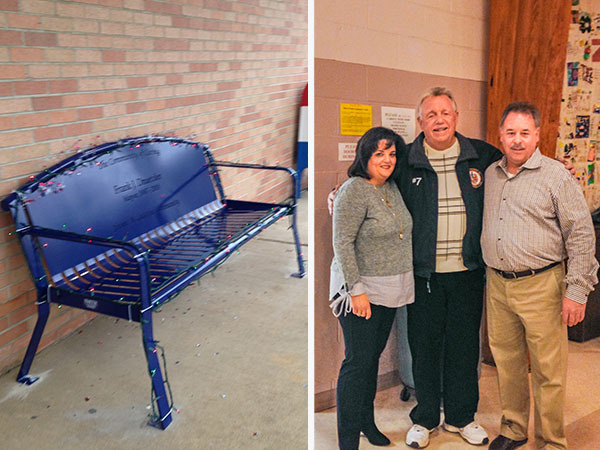 One special part of the event was the unveiling of Frank’s Retirement Bench. The bench serves as a physical reminder of all the duties Frank did over the years. Some of these duties included: Memorial Day parades, Labor Day block parties, fishing contests, block parties, and the list goes on and on. We make sure that the bench design is exactly right before starting the manufacturing process. To accomplish this, you will be sent a bench proof via email. This will give you a realistic look at how the finished product will look. From there, you will have a chance to work with the designer on any final changes before the metal bench is laser cut.